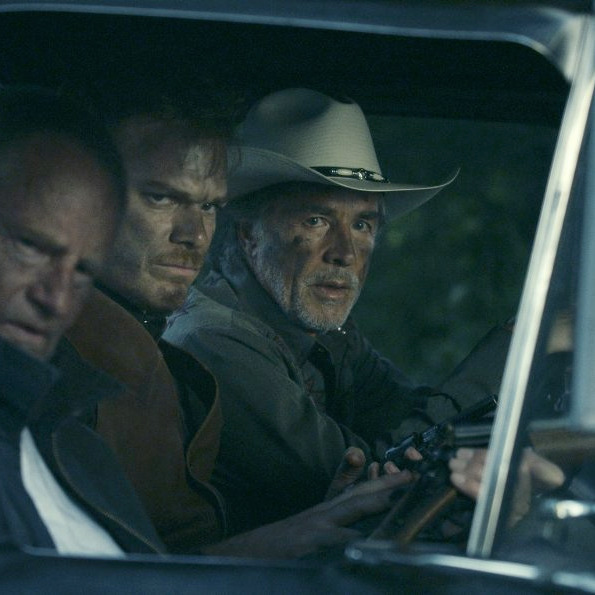 Jim Mickle’s Cold in July is a noir thriller that at first seems straightforward, compact, scary but a mite predictable. Michael C. Hall is Richard Dane, a mousy picture-framer in a small Texas town who—in a superbly edited sequence—accidentally shoots a burglar in his house in the middle of the night. Almost immediately, he finds himself the focus of the dead man’s vengeful ex-con father, Russel (Sam Shepard)—a wiry, chilling resourceful criminal with a folksy way of saying hey and then getting past a battery of police officers and into Dane’s little boy’s bedroom. So far, so Cape Fear. Then come the twists and turns—sudden, hairpin, outlandish. Before you quite know what’s happening, you’re swerving into another sort of movie altogether. And then another. You might not buy them all, but what a great ride. Mickle made one of the few excellent post-Romero zombie thrillers, Stake Land, and Cold in July is even more fun. He clearly relishes genre conventions and relishes even more turning them inside out. Although he sticks fairly closely to the good novel by Joe R. Lonsdale (a smart change: the burglar has a gun in the book but not the film), Mickle makes the story his own. The Texas heat seems to intensify as the hero finds himself tugged along by circumstance—you can feel his jitters, smell his sweat. Hall is terrific. His Dane is 100 percent unlike his Dexter: His brain and body seem disconnected, a scary beat between every thought and action. Shepard finds the perfect mix of unearthly cool and inner pain. Don Johnson shows up halfway through as Jim Bob, a pig-farming private eye, and he gives the film a welcome shot of gonzo. This is a crazed, lawless world and Johnson turns out to be a hell of a tour guide. Toward the end, Cold in July loses some narrative clarity, and Mickle obviously couldn’t figure out a way to wrap it up. (The book’s ending is better.) But that strikes me a small price to pay for a story so gloriously WTF. *This is an extended version of an article that appeared in the May 19, 2014 issue of New York Magazine.